Until the introduction of the Matterhorn at Disneyland in 1959, the world's first tubular steel roller coaster, all thrill machines had wooden tracks. With the advent of steel coasters, ride engineers were able to design much faster rides. Today, the ​fastest roller coasters are all steel (with the fastest topping out at a face-melting 150 mph). However, ride designers have made progress in building ever-faster wooden coasters as well and have recently nudged past the 70-mph mark -- which is really fast for a coaster made of wood. Most of the speed demons are located in the U.S. Some of the rides at the top of the list are a bit controversial in that they are not traditional wooden coasters. Let's start the top-10 countdown with one of the non-U.S., conventional rides. Montezum gets its "revenge" with a wicked fast, traditional wooden coaster experience. At 139 feet, the Brazilian ride is among the world's tallest woodies. It features a huge, highly banked helix that delivers some bone-crushing positive G-forces. Fractions of a mile-per-hour separate some of the coasters, with T Express clocking in a mere 6/10 of a mile faster than Montezum and 2/10 of a mile behind The Beast. It would only make sense that the fastest coasters are also among the tallest and steepest (the energy has to come from somewhere to generate the high speeds), and, at 151 feet, the South Korean coaster boasts one of the highest drops of any woodie in the world. The fastest coasters aren't necessarily also the longest ones, but at 5,383 feet, T Express is one of the world's longest thrill machines. According to stats provided by the park and the coaster manufacturer, The Beast clocks in at 64.8 mph. Perhaps it hits that speed now, but more likely it was originally designed to go that fast and no longer reaches its potential. The Beast is loaded with what are known as trim brakes, devices that slow the speed of coaster trains to make the ride less jarring and/or to help prevent wear and tear on the train and the track. For that and other reasons, some afficianados downgrade the popular and highly regarded ride and consider it to be one of the most overrated roller coasters. You can also read a review of The Beast. It might be more accurate to say that American Eagle is tied for the Number 7 position with…itself. 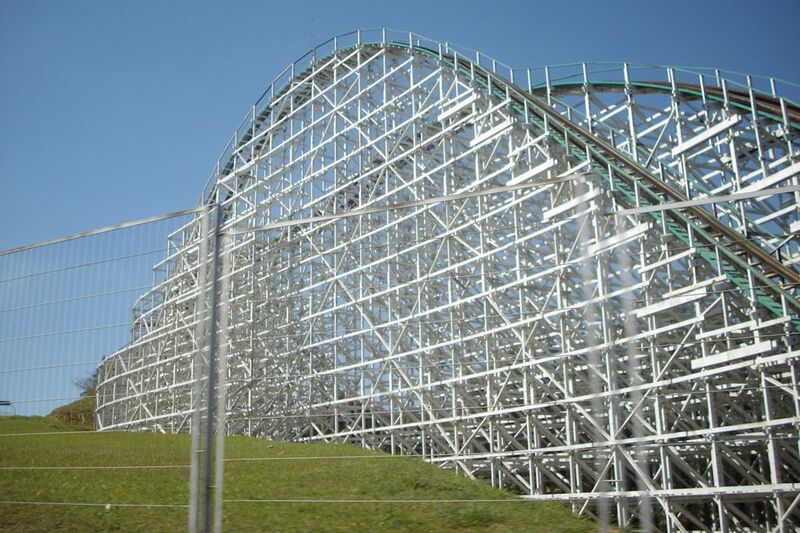 As a twin coaster, the wooden coaster features two tracks with two trains that run simultaneously. Both tracks offer the same stats with both trains topping out at 66 mph. At one time, American Eagle was a beloved ride. It has not aged particularly well and does not make this list of the best rides at Six Flags Great America. With a mere 3/10 of a mile-per-hour separating Number 6 from Number 5, it's probably safe to assume that The Boss -- which has nothing to do with Bruce Springsteen, by the way -- might move down a notch in the fastest roller coaster rankings on any given day depending on weather conditions, the weight of passengers, and other variables. One of three world-class wooden coasters at the family-owned Holiday World park in the small town of Santa Claus, Indiana, Voyage stands tall above the rest and ranks among the highest, longest, and steepest woodies in the world as well as one of the fastest. It is a sensational ride (if a tad rough) and gets a nod here as one of the best roller coasters in the world. Read a review of Voyage. This is where the fastest wooden roller coaster rankings ​run into a bit of a speed bump. Outlaw Run opened in 2013 and was among the first to incorporate the innovative "topper track" developed by ride manufacturer Rocky Mountain Construction. Unlike a traditional wooden coaster, a steel runner covers the entire length of track in the newfangled rides. That allows the trains to use polyurethane wheels (similar to the ones that are used on steel coasters) and to perform elements such as inversions that classic wooden coasters are incapable of delivering. It also probably allows the modified coasters to go faster than traditional wooden coasters -- hence the problem with the rankings. You can read more about the breakthrough track design in this preview of Outlaw Run. You can also read about another Rocky Mountain wooden coaster innovation, the "Iron Horse" track, in this review of Iron Rattler. With a stomach-dropping drop of 159 feet, the aptly named Colossos revs up to a hearty 68.4 mph. Like El Toro (which follows at position 2 on the list), the coaster features a prefabricated track that allows it to be both fast and remarkably smooth. The stellar El Toro, which is among the best roller coasters (if not the best roller coaster all-around), also uses an innovative track design that makes its leap to the top of the fastest coaster list somewhat questionable. Unlike a traditional woodie (or the wood-steel hybrid design championed by Rocky Mountain Construction), the Six Flags Great Adventure ride features prefabricated "plug-and-play" track sections that enable El Toro to be remarkably smooth as well as incredibly fast. You can read about the intriguing track and the wonderful ride in this review of El Toro. Opened in spring 2016, Wildfire clock in as the world's third-fastest wooden roller coaster, beating out El Toro by a fraction of a mile-per-hour. It also boasts a long (161 feet) and steep (83 degrees) drop. Like the woodie that follows it on the list, Goliath, it was manufactured by Rocky Mountain Construction and features its Topper track. It also includes three inversions. The ride is currently unrated because it requires regulatory approval and is not operating. Another Rocky Mountain Construction coaster that uses its patented Topper track, Goliath hits a record-breaking top speed of 72 mph. Again, unlike traditional woodies, such as the other Six Flags Great America coaster on this list, American Eagle, the newer ride may not be considered a wooden coaster by ride purists. It is also the tallest and steepest (a near-vertical 85 degrees) wooden coaster in the world. Read more in this review of Goliath. The innovative Rocky Mountain Construction owns the top spots on the speedy wooden coasters list, including world's fastest, Lightning Rod. It is the world's first launched wooden coaster. Read a review of Lightning Rod.